This book was one I received through my daily Free Kindle Downloads list and I absolutely LOVED it! Right from the off! “Kathleen Findlay is married to a cad, her mother is driving her crazy and her life is falling apart. Then her uncle dies, leaving her the family’s Revolutionary-era home and, she believes, an escape from her chaotic marriage. But one afternoon, while searching for a rake, she discovers a man in her garden shed — and a free fall through the centuries. For anyone who loves a good time travel romance this is the story for you! I sometimes will read them, but not frequently, however, when I do, I find myself immersed in the author’s world right along with the characters. Kathleen is a pragmatic woman of the modern world, she is independant, yet still tied to her ex Cameron who refuses to give her a divorce only because he still desires the social standing his marriage brings – yet he wants his cake and to eat it too so to speak as he keeps a mistress on the side. The book opens with Kathleen finding out her Uncle has passed on and left her his home in Pennsylvania, she travels from her home in NC to settle the affairs of the house and close it out for sale. However, when she goes looking for a tool in the shed her entire world is thrown for a loop. It is through a series of chain events leading to the shores of NC that her life is completely up-ended as she knows it – not only does she need to teach Robert about how to live in the 21st Century, she is also learning a lot about herself and how she can be more independant from Cameron and maybe even learn to love again. I saw that this book as one where the descriptions of the scenary pull you in, I could almost place myself in the Beach cottage on the outer banks, taste the salty air and see everything as described. I felt for Kathleen’s struggle to come to terms with her new life and the demands it places on her – all the while feeling her desire to be free of Cameron and learning to love again with Robert. A beautiful tale of two people who, through a strange series of events, come together and bond while forging a love that crosses time. Highly reccomended! Block the time needed, this one is hard to put down! 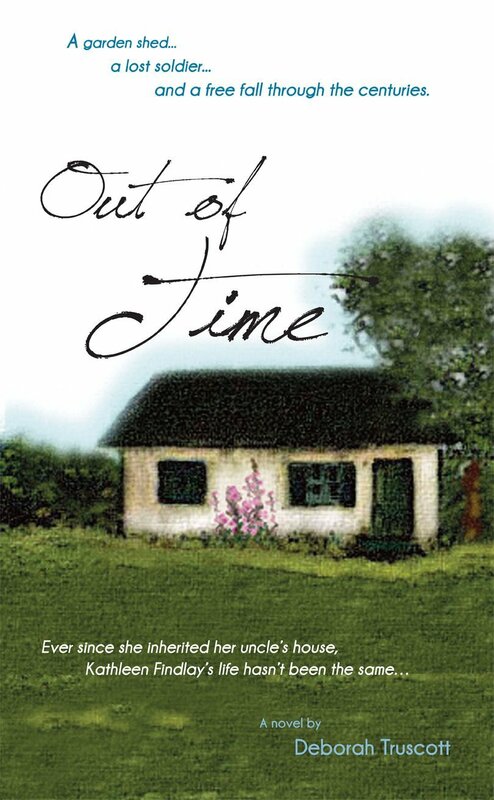 This entry was posted in Book Reviews and tagged Book Review, books, Deborah Truscott, Fiction, Out of Time. Bookmark the permalink. Awesome! I am sure you’ll enjoy it as much as I did!